Summer returned and so the question arose again. What to wear? I bought this Shona Joy dress in Manly. It was originally $300 and was on sale for $30. The back zipper broke but was easily fixed. It’s strangely breathable and fits like a glove. 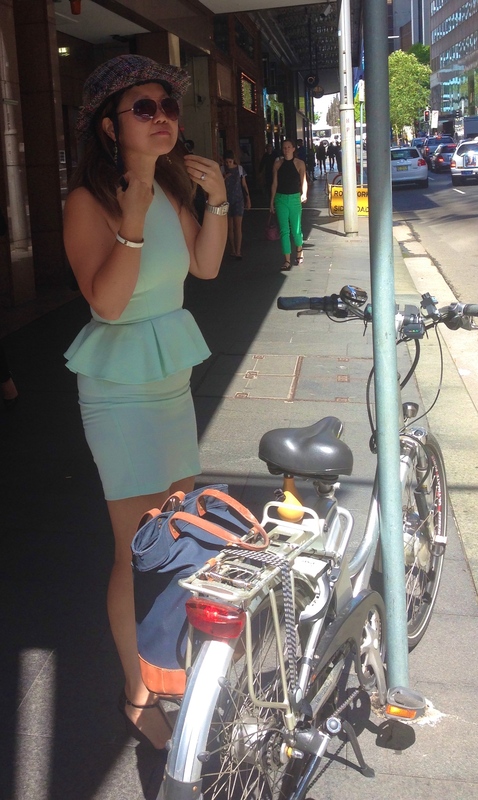 The peplum hides that extra bit of lunch that I can’t always resist. Watch out for the taxis! 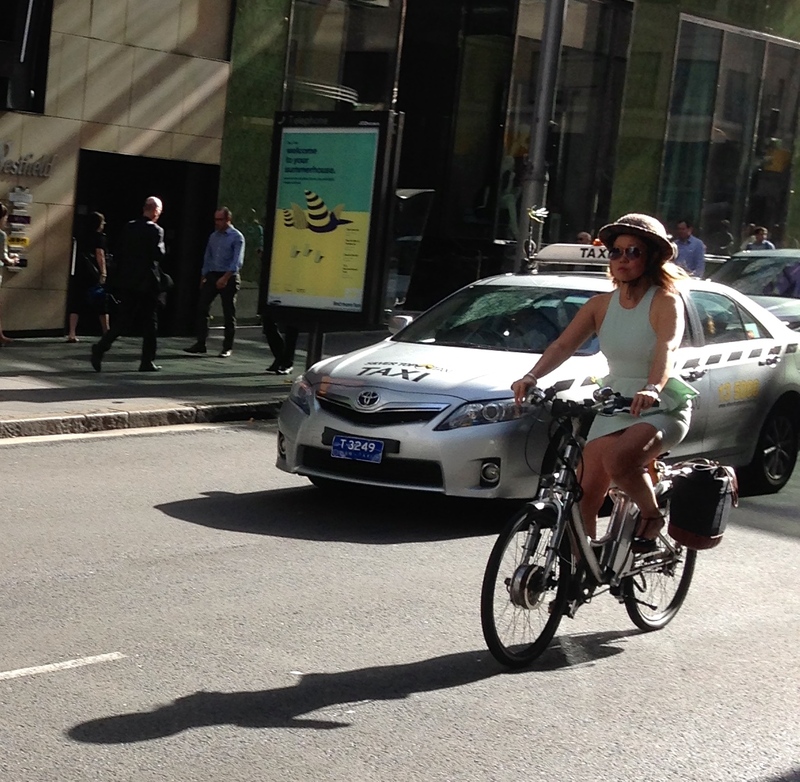 People always ask me if I feel comfortable riding in the Sydney CBD and in traffic. 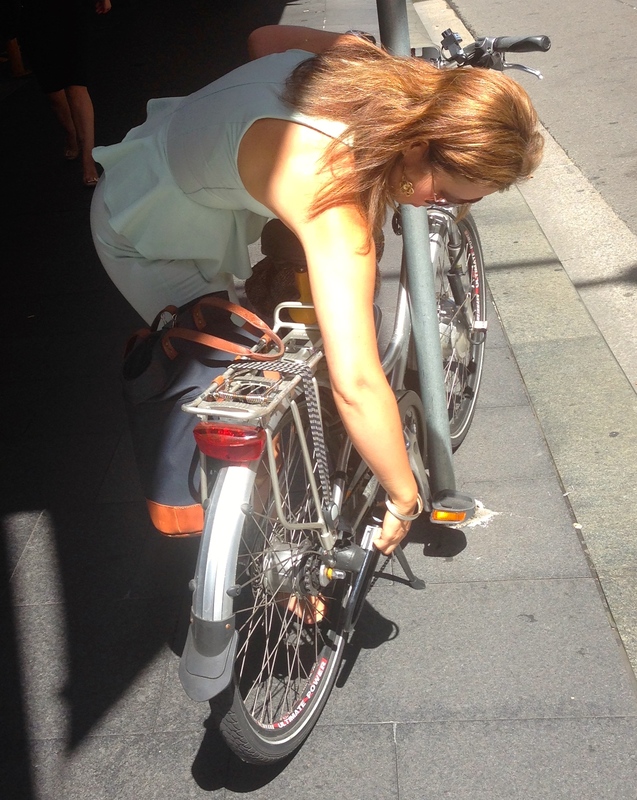 I took a Cycling with Confidence course that the City of Sydney offered for free (!) three years ago. I learned how to negotiate with traffic by clear communication of my intent, increased awareness of the traffic, and choosing my path beforehand. I recommend it highly. However, I have had several altercations with taxi drivers. The majority are reasonable. Quite a few have no clue. Unfortunately, this applies to all drivers. My approach is to be aware of the cars around me and to anticipate. I also maintain a safe speed. On the e-Zee bike, I can keep up with traffic and I find that the drivers respect me. But when they have not, “Mate” shouted loudly works well. If not, “Darling, Go back to the suburbs!” is also quite effective. I realise there are several steps to getting underway which are second nature to me. I thought I would show you what they are. The first thing that I do is unlock my Yakkay helmet. There is no need to carry a helmet. Make sure the strap goes through the lock. Put your lock away. Hugh Flower, at the now closed City Bike Depot, found this clever spot for me to mount the Kryptonite lock. Insert key into battery to start the motor. I have a throttle but I tend to use pedal-assist when riding in traffic. I can adjust the amount of pedal-assist that I need by using a dial which is mounted on the front handle-bars. 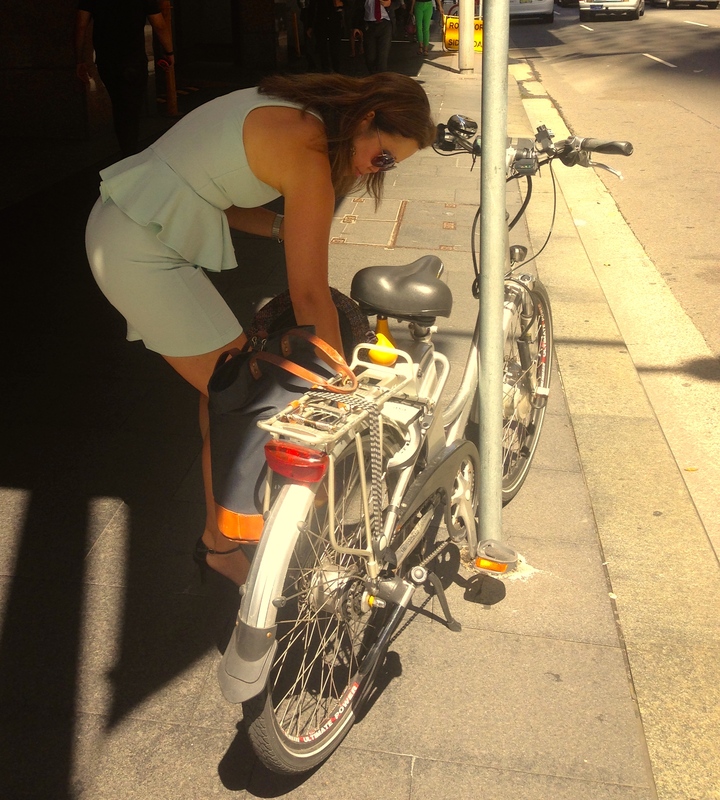 I bought the eZee Sprint from Glowworm Bicycles in Marrickville. 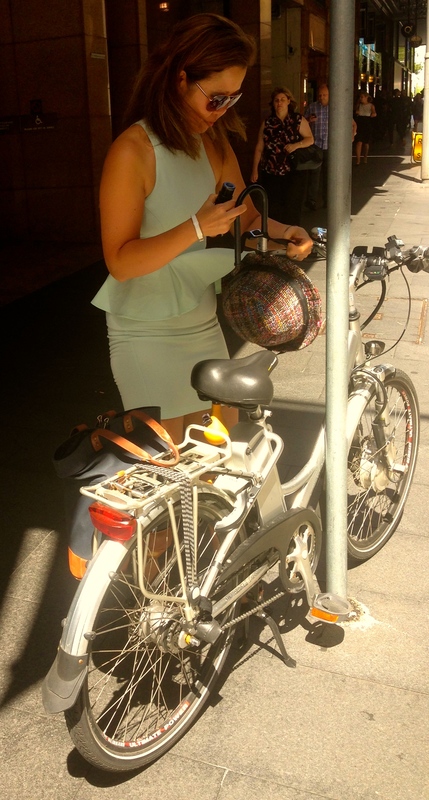 Lastly, Australia has mandatory helmet laws which I know dissuade many people from riding bicycles. The Yakkay is my concession. I have two others which I use for mountain biking and road cycling. But the Yakkay also gives me some sun protection in the summer with its wider brim. Hermes bracelet from my friend A all those years ago! Previous postA Reminder of Autumn after "The Rains". Next postIt’s Hot! Silk to the Rescue.